Employing a unique engineered wood product only recently produced by Oregon mills, a UO student team has won an Honorable Mention in a competition hosted by the American Institute of Architects Northwest and Pacific Region. The students in Professors Judith Sheine and Mark Donofrio’s spring studio designed a parking structure using Oregon’s newest structural wood product—cross-laminated timber, or CLT—an exceptional accomplishment in architectural education and design practice. 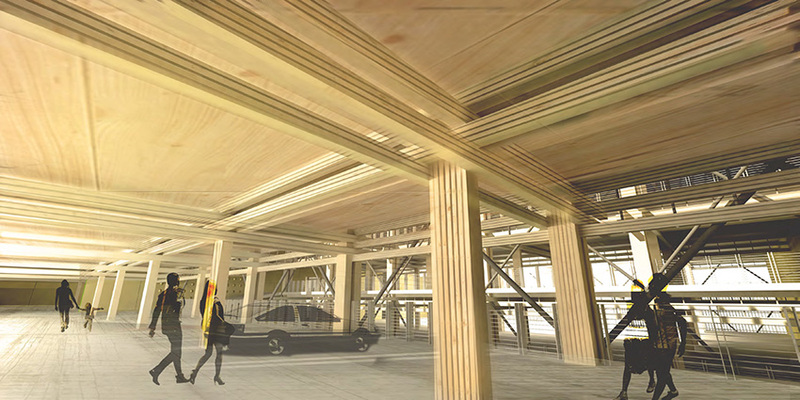 Above: Kaito: A Mass Timber Parking Structure for Springfield, Oregon was designed by undergraduate students Tom Adamson, Ryan Kiesler, and Tom Moss. Their work received an Honorable Mention by the American Institute of Architects Northwest and Pacific region. The spring term 2015 design studio was taught by Professors Judith Sheine and Mark Donofrio. The studio was sponsored by the city of Springfield, which plans to build a mass timber parking garage in their new award-winning, mixed-use development in the Glenwood district. It is likely to be the first structure of this type in the US. The student-designed structure promotes an aesthetic drawn from traditional light Japanese joinery and detail. It contrasts that aesthetic with thick, heavy shear walls in a way that juxtaposes the human scale with the larger scale CLT panels. The project name is derived from the Japanese word for “box-kite,” kaito, which derives its form from the kites’ contrasting structural system. Currently, cross-laminated lumber is produced by D.R. Johnson, a family-owned Southern Oregon timber company and the first supplier of CLT, a certified structural wood product. The plant produces panels 10 feet wide by up to 60 feet long and between 4 to 10 inches thick. Although CLT has been produced in Europe for years, D.R. Johnson is the first US manufacturer. Earlier this year, the University of Oregon and Oregon State University announced they have joined forces to advance the state’s wood products industry with the establishment of the National Center for Advanced Wood Products Manufacturing and Design. The initiative combines the research and design talents of the University of Oregon School of Architecture and Allied Arts with the wood products science expertise in Oregon State University’s College of Forestry and the structural design expertise of OSU’s College of Engineering. 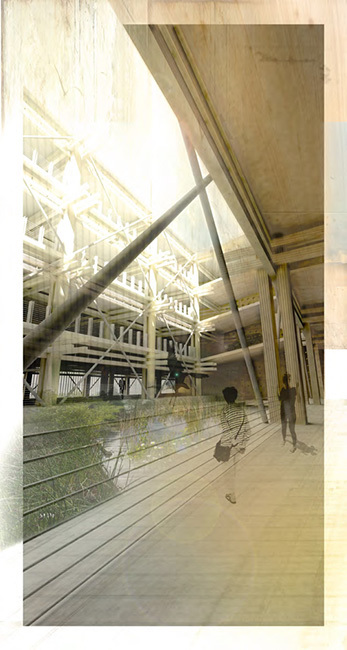 Above: Detail perspective of the use of cross-laminated structural timber in the design. The garage breaks the spanning members into smaller beams and intersects them throughout the structure. Separating these smaller elements provides opportunities to appreciate the unique quality of the material at a human scale, while maintaining Type-IV construction by using the 8 x 10 ft. glulam beams. “Our architecture students are very excited to be part of this new joint UO-OSU effort to put Oregon at the forefront of developments in this field,” says Judith Sheine, one of the instructors of the studio and head of the Department of Architecture. Many in state and federal government and in industry are partnering to advance the use and market acceptance of engineered wood products. Oregon Governor Kate Brown announced in mid-September at Oregon BEST FEST, an annual clean tech conference, that a design competition will be held to promote the use of cross-laminated timbers. The competition opens October 1 and winning entries may receive up to $200,000 in funding and services. The competition is cosponsored by Oregon BEST and the University of Oregon and Oregon State University’s National Center for Advanced Wood Products Manufacturing and Design. Competition details can be found on the Oregon BEST website. 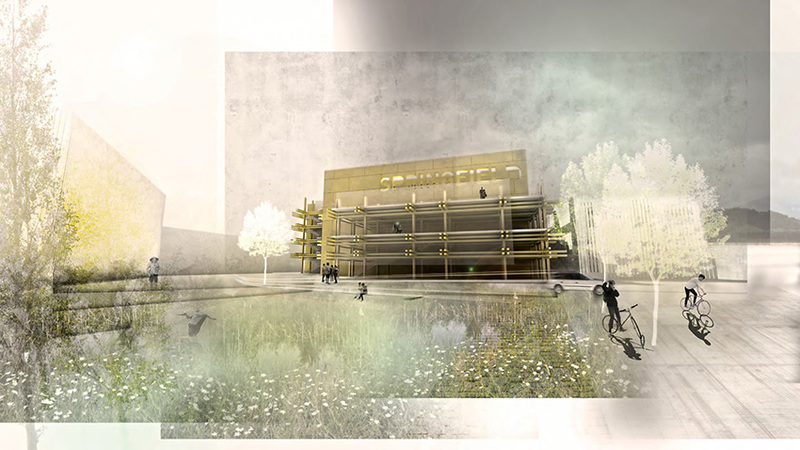 Above: The design takes advantage of the water run-off the structure will inevitably encounter by implementing a bio-swale water treatment strategy in the center courtyard. The bio-swale filters the water before entering the Willamette River.